On display in the Faulkner Room on the third floor of the J.D. 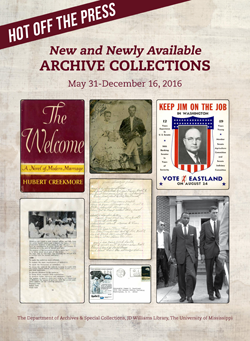 Williams Library, this exhibition is open from May 31st-December 16 of this year and highlights new acquisitions and newly processed collections from Special Collections' literary, historical, visual, political and blues collections. We invite visitors to Special Collections to view the new exhibition during ourcurrent hours. For more information please contact Dr. Jennifer Ford at 662-915-7639 or at jwford@olemiss.edu.